“What do you mean I can't bring my service animal in?" 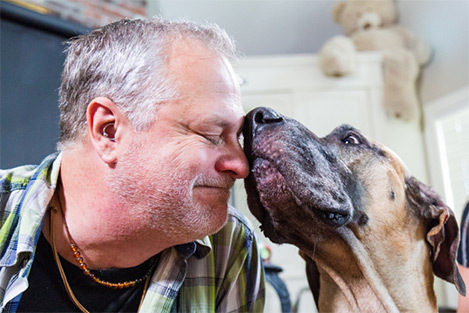 Member Craig talks life with fibromyalgia and service dogs. “What do you mean I can’t bring my service animal in?” Member Craig talks life with fibromyalgia and service dogs. Craig Braquet (woofhound) is living with fibromyalgia and severe degenerative disc disease, the result of a multi-car accident in 1979. 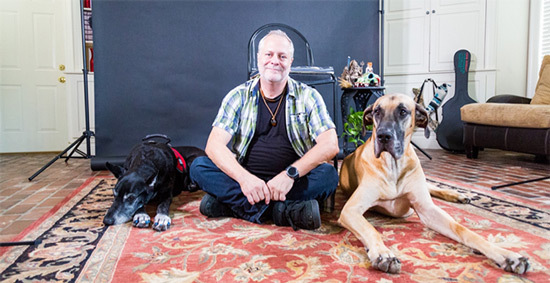 We first introduced Craig when he joined the 2015-2016 PatientsLikeMe Team of Advisors, but today we introduce his dogs, Luna, Oliver and Dakota (check out their cameo in Craig’s recent #MoreThan video). See what Craig has to say about training his own service dogs, taking them into public places, and how they’ve helped him manage his condition. Craig with his service dogs Luna (left) and Oliver (right). Craig says Luna gave him a new purpose in life, and he found that training her to be a balance and stability service animal gave him the motivation to “get out of bed and rejoin society.” Regular exercise is beneficial for people living with fibromyalgia, and Luna helped make that effort worthwhile. While the American Disibilities Act (ADA) has clear guidelines about the rights of those with service animals, Craig has found that not all establishments are aware of these laws. On a recent trip to Truth or Consequences, a small town in New Mexico, he was not allowed to bring Luna into a local hot springs spa, even when he explained that she was his service animal. Service, therapy and emotional support animals: What’s the difference? The ADA says a service animal is “any dog that is individually trained to do work or perform tasks for the benefit of an individual with a disability, including a physical, sensory, psychiatric, intellectual or other mental disability.” Other species of animals, trained or not, aren’t considered service animals. The ADA doesn’t require professional training for service animals, and people with disabilities have the right to train the dog themselves (but state and federal laws differ, so make sure to read up on your state’s laws). Check out this FAQ to learn more. A therapy animal is an animal that’s been trained to help lift the spirits of people other than its handler. 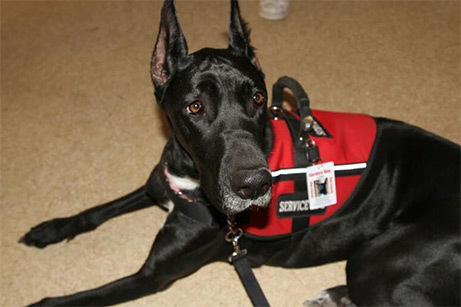 Therapy animals often visit places like hospitals and nursing homes to cheer up the people living there, though their handlers are not given public access rights like those of service dogs and their owners. Emotional support animals provide companionship, relieve loneliness, and can help with depression, anxiety and other mental health conditions, but don’t need to have any special training to perform tasks that assist people with disabilities. While emotional support animals are often used as part of a medical treatment plan to provide therapy to their owners, they’re not considered service animals under the ADA. See who’s tracking their experience with service animals on PatientsLikeMe, and check out what some members have said in more than 150 treatment evaluations on pets. Do you have a service animal? Share in the comments how they’ve impacted your life and your health. And join the conversation with others discussing this in the PatientsLikeMe forum.